And that’s exactly why savvy buyers and owners obsess about how much their home will be worth in a few years—and why. Will a bigger or smaller abode appreciate most in a few years? Are those granite countertops and fancy-shmancy stainless steel appliances really worth splurging on? Or would it be better to add on a patio inspired by Architectural Digest spreads? And if you’re planning on selling, down the road, should you pay a premium to live near public transportation—or the top school districts? Yeah, it’s enough to make you reach for the anti-anxiety meds. The trick, of course, is to do everything you can to ensure that your home appreciates above market rate—or at very least retains its value. And that’s where we at realtor.com® come in. If the economy is strong, a home’s value generally increases 3% to 4% every year, driven by inflation and natural population growth. From 2011 to 2016, the national housing market was recovering from the bubble at a slightly higher speed: 6.3% a year, on average. To find out what will boost a home’s value the most, our data team took a deep dive into millions of listings on realtor.com from 2011 to 2016, and calculated the annual price growth rate of homes with particular features. Admittedly, it’s hard to separate one feature from a home and single it out as the reason for price appreciation. But when we crunched a lot of data and compared one feature with another, we found some useful—and sometimes surprising—patterns. Ready? Stay calm, we’ve got you covered! Let’s get into the price appreciation game. You may dream of walk-in closets, a roomy master bedroom, and a three-car garage, but bigger isn’t always better. Turns out the smallest homes actually appreciate the fastest: Homes of less than 1,200 square feet have appreciated at 7.5% a year for the past five years. Meanwhile, homes larger than 2,400 square feet only inched up 3.8% a year. This coincides with the trend bringing buyers back into city centers, where every extra inch is a luxury. Today’s young buyers are looking for more efficient spaces that are just large enough for their needs. Many would prefer to be close to work, cultural amenities, and fun bars and restaurants. “[Millennials] believe that they live outside the home—that could mean a coffee shop, bar or restaurant, or a park,” says Jason Dorsey, chief strategy officer for the Center for Generational Kinetics, a marketing firm in Austin, TX. Yet the supply of smaller homes is limited—housing developers still prefer to focus on the high-end market, so they can get more bang for their buck. Furthermore, those who own smaller abodes aren’t trading up quickly enough to meet market demand. 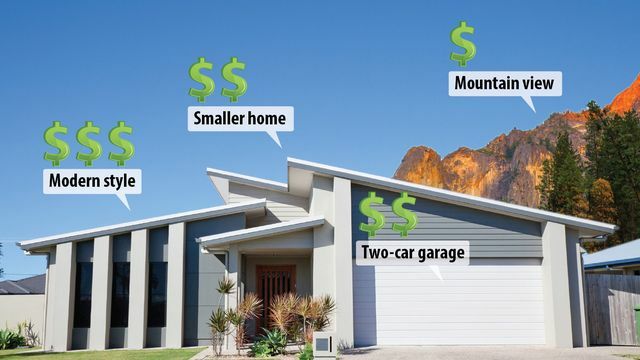 “Because the market [for smaller homes] is tighter, prices tend to increase more quickly,” says Jonathan Miller, president of the real estate appraisal firm Miller Samuel.